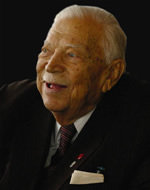 Sıtkı Davut KOÇMAN, the sponsor of our University and a philanthropist, was born in Besiktas-Istanbul in November 13, 1912. Sıtkı Davut KOÇMAN started primary school at Beşiktaş Şems-i Mekâtib but completed his primary and middle education in Amasya. After finishing Kastamonu Boarding High School, Sıtkı Davut KOÇMAN studied at Zonguldak Mining Engineering School between 1926-1931, and he finished the school in first place. Between 1932 and 1939, Sıtkı Davut KOÇMAN worked as an engineer and the director of Göcek Branch of Stanley Paterson firm, which was the first in discovering and managing chrome mines in Turkey. He married Miss Mefharet in 1937 and had two children. After the closure of Göcek plant, KOÇMAN moved to Istanbul in 1940 and started his own business by founding two companies. After completing his military service in 1942, he undertook the job of supplying and transporting mine timber in Zonguldak Mining Plants between 1943 and 1947. After he founded Koçtuğ Marine and Commerce Company in 1952, he established Köyceğiz Chrome Company, Bursa Toros Chrome Company, and Kıyra Chrome Company. Sıtkı Davut KOÇMAN’s real success in Turkish Industry was in automotive sector. In partnership with the British business people, he established BMC Industrial and Commerce Company and its facilities in 1957. These facilities became the first integrated automotive plant in Turkey. Diesel engine, cars, trucks and tractors were manufactured in these facilities. Elizabeth the Second, the Queen of Britain, rewarded KOÇMAN in 1973 by bestowing him “Outstanding Merit Order”. companies are still active today. Besides his success in industry and commerce, KOÇMAN highly prioritized and supported education and health by founding various schools and hospitals throughout Turkey. He also supported many students with scholarships throughout his life. He began sponsoring Muğla Sıtkı Koçman University in 1999 and spent 53.328.786.000.000.-TL since then. Sıtkı Davut KOÇMAN is the ownership of War of Independence Medal, which was given to him by his father, and State Outstanding Service Medal, which was given by the Council of Ministers in 2000. Muğla Sıtkı Koçman University granted him “Honorary Doctor” degree in 2000. He knew French, German and English.